Century Cycles Blog: The derailleurs that inspired "Disraeli Gears"
5. Derailleur systems are the "gears" on what type of device? A derailleur is the system that includes the gears (sprockets, actually) on a bicycle. 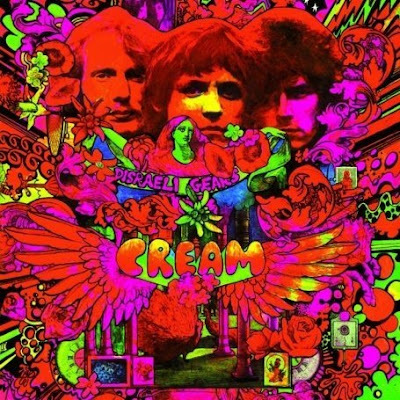 I just found out this week that the classic Cream album Disraeli Gears is named for a roadie's mispronunciation of the word "derailleur." Cool, right? Cool is right, Ken! But I wanted more details. Off to Wikipedia! The title of the album was taken from an inside joke. Eric Clapton had been thinking of buying a racing bicycle and was discussing it with Ginger Baker, when a roadie named Mick Turner commented, "it's got them Disraeli Gears", meaning to say "derailleur gears", but instead alluding to 19th Century British Prime Minister, Benjamin Disraeli. The band thought this was hilarious, and decided that it should be the title of their next album. Had it not been for Mick, the album would simply have been entitled Cream. The album, which featured "Strange Brew" and "Sunshine of Your Love," went on to be a huge seller in both the UK and America. Funny how mispronunciations have a habit of turning up on album covers. In a godda da vida is another example. Usually there are mind altering substances involved. Classic.